A super king sized bed, harbour views and the last of the setting sun means this bedroom has a great deal to offer. This room, also known as the Little Victoria room where Princess Victoria recuperated in 1835, there are very high ceilings with elegant, Georgian doors leading out on to the Regency balcony. A super king sized bed, harbour views and the last of the setting sun means this bedroom has a great deal to offer. Situated on the first floor with use of the balcony this room measuring 17 square meters looks out across the lovely Albion Place and its well-kept gardens. With the added option of combining the spacious room to the rear of the building on the first floor, you have the ideal restful place for your family by the sea. …you want to look out at Ramsgate through the eyes of the most revered Monarch Britain has ever had. "Firstly, the Albion is a gorgeous creation. With wow-factor antiques, adeptly sourced by Fontaine Decorative, and fashionably dark walls, the heritage interior design is spot on for this large seafront Regency townhouse, built in 1791. As soon as I step inside, I love it. 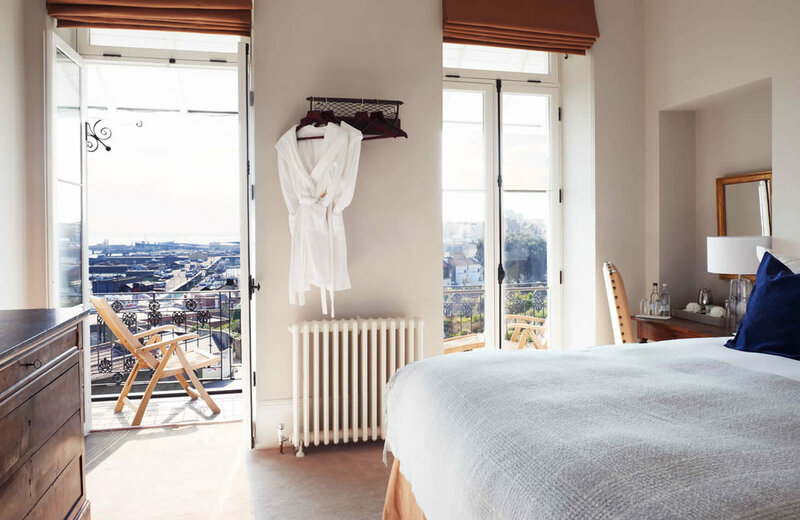 Cornicing, high ceilings, old shutters, a grand staircase ... the place smarts with original features, and the new bits – lovely globe pendant lights, posh beds – are cleverly chosen. "